The Brazil nut, which botanically is not a nut but a seed, is native to South America. The tree itself is one of the largest in the Amazon rain forest. It can reach up to 160 feet in height with a diameter of up to 6 feet. It takes approximately 14 months for the fruit to mature. When mature, the thick, woody shell encases 8 to 24 triangular seeds that are arranged in sections that resemble the configuration of an orange. The trees are not grown on plantations, but instead grow and thrive in tropical forests. The nuts are harvested during the rainy season between November and March. unsaturated fats, specifically oleic acid and palmitoleic acids, which are associated with improving overall heart health. Studies show that due to their high content of selenium, they can help prevent blood clots, protect from various heart diseases and help prevent heart attacks, atherosclerosis and stroke. There is a definite connection between heart health and cholesterol levels. Brazil nuts have an amazingly high content of unsaturated fats. Unsaturated fats are referred to as good forms of cholesterol, also known as omega-3 fatty acids. Omega-3 fatty acids help eliminate dangerous omega-6 fatty acids from the cardiovascular system. High cholesterol can lead to a myriad of health problems, especially heart related issues. Eaten in moderation, these nuts can be a vital part of a cholesterol lowering diet. They are a heart healthy snack that offers many other health benefits. Brazil nuts are a nutrient rich food. They as a good source of vitamin B6, riboflavin, niacin, folate and Pantothenic acid. A one cup serving of whole nuts provides 38% DV of vitamin E and 55% DV of Thiamin. That same size serving provides 18%D iron, 21% DV calcium, 25% DV potassium, 36% DV zinc and 81% DV manganese. Also, in that one cup serving, you will acquire 125% DV magnesium, 96% DV phosphorus, 116% DV of copper and an amazing 3643% DV selenium. You can get almost half of the daily recommended fiber and 38% DV protein when you enjoy a cup of Brazil nuts for snack. Your body can’t produce selenium. Therefore, it’s essential that you include foods in your diet that provide selenium. 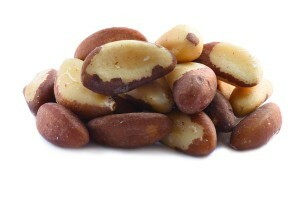 Brazilian nuts are the richest source of selenium. One medium size nut provides more than the recommended dietary allowance of selenium. Staying healthy requires that your immune system function at its optimum level. Selenium helps fight free radials and boosts the immune system. Selenium is attributed with preventing bone, prostate, colorectal and breast cancer. A deficiency of selenium can lead to an increased risk of developing bladder, lung, stomach, esophagus, and liver cancer. Adults with digestive health issues such as Crohn’s disease, celiac disease or those who are experiencing serious inflammation and chronic infection issues are likely to be deficient in selenium. To obtain an optimum level of overall health, the thyroid must function properly. An adequate intake of selenium is essential for your thyroid to function properly. The selenium in Brazil nuts can boost testosterone levels. The high percentage of magnesium found in this nut is also a contributing factor in increasing testosterone levels. Natural cholesterol is plays a vital role in testosterone production. Brazil nuts are an excellent source of bio-active natural cholesterol. These nuts are also a good source of antioxidants that are attributed with protecting testosterone molecules from oxidation. They are also an excellent source of Arginine which is a substance that helps veins dilate and relax hereby allowing blood to flow more freely. Due to the specific benefits these nuts have for men’s health, finding a source for Brazil nuts for sale that offers an opportunity to make Brazil nuts bulk purchases is a budget-wise way to improve your overall health. There are numerous reasons for making Brazil nuts a part of a weight loss plan. Their high fiber content can promote satiety and reduce your desire to eat more than you should or to frequently reach for unhealthy snacks throughout the day. Eating these nuts in moderation will help your body produce more thyroid hormones that will keep your fat burning metabolism high. Another weight management benefit of these nuts is that they are rich in an amino acid known as arginine. Arginine can help increase the expenditure of energy and promote fat loss. In addition to promoting heart health, Brazil nuts play a significant role in promoting healthy skin. Their selenium content can increase the elasticity of the skin which will reduce pre-mature aging and wrinkles. It an also help reduce the risk of skin cancer. The zinc content of these nuts can help protect against the development of acne or reduce its severity. The fiber content of these nuts make them beneficial to the digestive system. Eating these nuts can help prevent gastric ulcers, cramps, constipation and bloating. The benefits gained from getting enough fiber in your diet can also help prevent more serious health issues such as colon cancer. Brazil nuts are a good source protein. Proteins are an essential part of a healthy diet. It is necessary to muscle and cellular growth. It is also necessary for the healing of wounds and or energy.